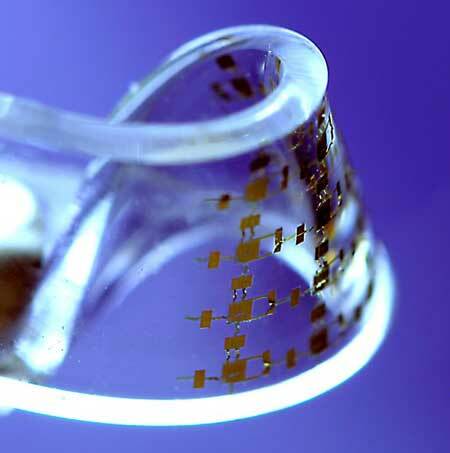 (Nanowerk News) Electronic components that can be elongated or twisted – known as “stretchable” electronics – could soon be used to power electronic gadgets, the onboard systems of vehicles, medical devices and other products. And a 3-D printing-like approach to manufacturing may help make stretchable electronics more prevalent, say researchers at Missouri University of Science and Technology. Writing in the January 2017 edition of the journal Micromachines ("Materials, Mechanics, and Patterning Techniques for Elastomer-Based Stretchable Conductors"), Missouri S&T researchers assess the current state of the emerging field of stretchable electronics, focusing on a type of conductor that can be built on or set into the surface of a polymer known as elastomer. One challenge facing this class of stretchable electronics involves “overcoming mismatches” between the flexible elastomer base and more brittle electronic conductors, the researchers explain in their paper. Pan and his colleagues see additive manufacturing as a relatively economical approach to creating these new devices. At Missouri S&T, they are testing an approach that Pan calls “direct aerosol printing”. The process involves spraying a conductive material and integrating with a stretchable substrate to develop sensors that can be placed on skin.